Since 1999, Habitat for Humanity of Tuolumne County has built 26 new homes in Tuolumne County, including 18 at Parrotts Ferry Village in Columbia. We have also recycled 2 homes, providing a total of 28 families with shelter. 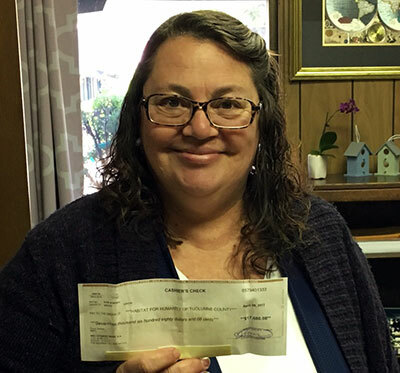 In May 2017, Tuolumne homeowner Rose Brisco, the first Habitat homebuyer in Tuolumne County, paid off her mortgage in-full and earlier than planned. Parrotts Ferry Village is a planned 35-home affordable housing development. The first foundations were poured in 2011. This project is addressing the county’s critical need for affordable housing through the construction of energy-efficient twin homes sold to qualified families. It is our goal to promote economic mobility by addressing community development needs by investing in affordable housing. Since 2011, Habitat for Humanity has been the only builder of affordable housing units in Tuolumne County. A new home is the family’s start in building assets and has positive impacts for generations, including a greater likelihood their children will attend college and be homeowners themselves. Habitat works with community partners to build pathways to economic mobility to preserve and increase access to affordable housing; and to connect individuals and families with tools and resources to achieve their financial and life goals. One hundred percent of the people Habitat serves are extremely low to low income (per HUD standards). Habitat creates pathways to stable homeownership through financial stability efforts including homebuyer education, budgeting, savings, credit and credit repair. We believe in the lifelong impacts of the lives we touch. A house is not just a shelter. It is a foundation for stable life patterns. Our impact, with community support, moves beyond immediate needs, providing financial stability and brighter futures for generations to come. Habitat homeowner children are: 44 percent less likely to have respiratory and other illnesses; 59 percent more likely to own a home within 10 years of moving from parent’s household; 62 percent more likely to acquire post-secondary education; and 116 percent more likely to graduate from college.